One of the hallmarks of a great documentary is its ability to not only appeal to people already interested in its subject matter, but also to make the material compelling to people who have no interest whatsoever. You don’t need to care about (or even like) basketball, Formula One or The Dixie Chicks to love Hoop Dreams, Senna and Shut Up and Sing because each manages to tell their story in a captivating manner without requiring that the audience be fans already. Kevin Macdonald’s Marley, an engrossing and exhaustive account of the life, loves and music of Bob Marley falls squarely into this latter category since it managed to engage me, someone who has hardly any interest in Marley, for pretty much all of its two and a half hours. A major reason why the film works so effectively, even for those of us who don’t own a well-worn 12” of Exodus, is that it spends time explaining why Bob Marley was important, rather than taking this as read. For someone who grew up in a world where Marley has always been an icon rather than a person, and where his music has always been part of the musical landscape, seeing it placed in a broader social and musical context creates a much better understanding of its importance to culture at large, and Jamaica in particular. Events such as a 1976 assassination attempt have much more resonance because the film establishes why Marley could be a political target. It makes for an altogether richer experience than just being told that Bob Marley was important and then listening to people reiterate that point without illumination. That ethos of making the effort to explain Marley for the layman extends to the interview subjects that Macdonald uses to illustrate his life. Using new interviews with friends, family and contemporaries – not to mention previously unseen footage of Marley himself – the film covers pretty much everything a newbie or long-time fan could want to know. From his poor upbringing, through his early struggles and later superstardom, right up to the last few months of his life when he was dying from cancer, the film hits all of the major points without ever feeling rushed, whilst at the same time suggesting that there is still much more of Marley’s life left to discuss. 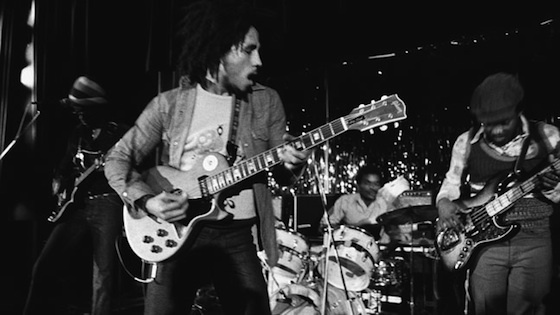 Carried along by the flow of the music, which is pretty much omnipresent and gives the film a strong forward momentum, it makes for a fun, moving journey that manages to be both broad and deep in its examination of Marley and his impact. It manages a fine balance between cultural commentary and personal anecdotes that illuminate what a vibrant personality Marley had, with the mix of new and archive footage serving to get across his undoubted charisma both on and off stage, with the performances featured throughout being a particular highlight. Since the documentary is officially sanctioned by the Marley family, with many members appearing both as interviewees and as producers, there are moments when the film seems to veer too close to hagiography. Most notably, details of Marley’s philandering and the occasionally distant relationship he had with his children are treated in a very off-hand manner, but it does at least address them head-on, even if only briefly, and this stops it just short of portraying him as entirely saint-like. At some points it goes entirely in the opposite direction, even heavily suggesting that Marley’s death was at least partly his own fault for refusing to consult with doctors even when it was clear that he was very sick. That unevenness fortunately doesn’t run throughout the film, but there is a definite sense that the version of Marley we are privy to has had at least some of the roughness taken away. Although Marley will ultimately mean more to people who are already fans of Bob Marley, the film itself is anything but a case of preaching to the converted. It’s a compelling examination of a fascinating figure which offers plenty of insights into the life and impact of an icon by revealing something of the man himself, whilst also placing him in a broader context. Reverence or appreciation of his work is not required in order to enjoy the film, though it may very well result from watching it.